Laser goggles are not a replacement for common sense or vigilance. 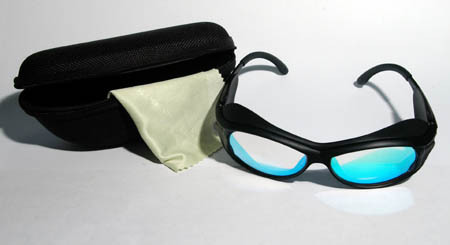 They are designed to protect against accidental exposure to laser radiation only. Never stare into a laser beam with or without goggles as serious and often permanent damage will result. Available in four types our laser safety goggles are designed to protect against red, green, blue or RGB lasers, and come complete with a rigid fabric case and lens cloth. I purchased a pair of RGB laser safety glasses from Stanwax Laser and received them by post the next day! The glasses seem rugged and well built with excellent side shielding that allows very little light in the sides. The glasses came in a sturdy zipped case with a handy keyring clip and a lens cloth. I can recommend these glasses and Stanwax Laser for their great customer service and prompt despatch.